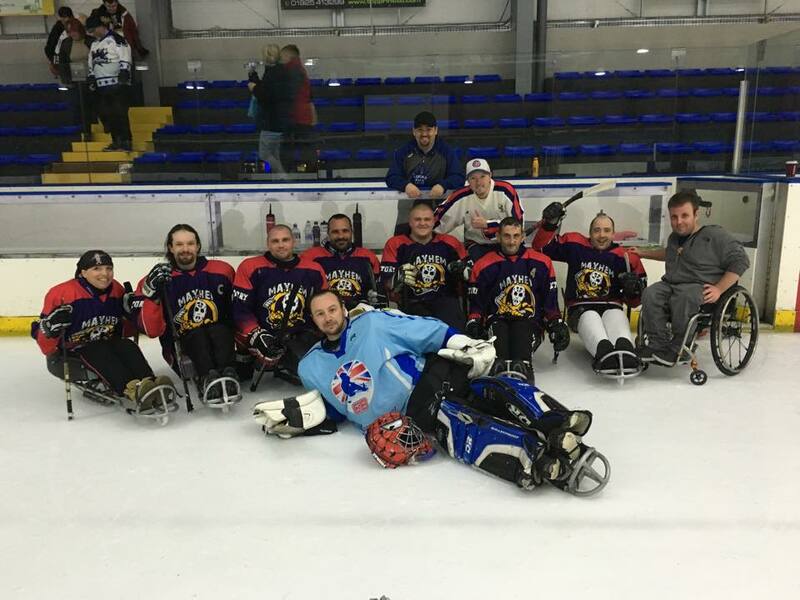 The Manchester Mayhem Para Ice Hockey Team secured their place in the end of season play offs with a dramatic last minute victory over Peterborough Phantoms at Silver Blades Widnes on Sunday. The game was very closely contested throughout and was a very entertaining spectacle for the sizeable crowd that had come to support the two very well matched teams. After a very close opening phase, with both teams having numerous chances, Mayhem took the lead on 12.48 with a goal from Graham Wilson (assisted Ant Booth and Rob Allen) and then a goalless second period meant that the contest was still very finely poised at 1-0 heading into the final 15 minutes. The Peterborough team – who had looked dangerous throughout finally broke down the stubborn Mayhem defence and fired in two goals in two minutes - both scored by Matt Coleman (36.59 & 38.18) – to take the lead with 7 minutes left to play. It was beginning to look as if it wasn’t going to be Manchester team’s day as the clock ticked down towards the end of the game but then Mayhem’s Karl Nicholson pulled the home side back level with a superbly taken goal at 42.07 (assists Wilson & Booth). With the score tied at 2-2 after 45 minutes regulation time, the game went into a 5 minute period of sudden death overtime – with the possibility of a penalty shoot-out if the scores were to remain level after that. The overtime period was played at tremendous pace and the atmosphere around the rink was electric. Both teams had their chances but neither could make that all important breakthrough but then, just as it looked as if the match would go to penalty shots, Graham Wilson fired in the dramatic game-winning-goal for the Mayhem with just 24 seconds left on the clock. The Manchester Mayhem are in action again in two weeks’ time - on Sunday 20th August - when they entertain league champions Kingston Kestrels in their final league game of the season at Silver Blades Widnes. The game faces off at 6.30pm and admission is free.